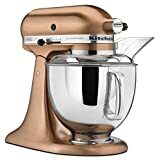 If you are like most bakers, you remember the day you got your first KitchenAid and the Best KitchenAid Mixer Attachments Set, almost as easily as you remember the day you had your first drink, or the day you got married, or the day your child started kindergarten. It’s a HUGE step, but an exciting one. Taking the plunge, financially, and deciding to put your big-baking-pants on by changing-up to a KitchenAid stand mixer and its myriad of KitchenAid mixer attachments, with all the related attachments, is exhilarating, motivating, and also a bit scary. Scary? Why scary? Because a KitchenAid mixer is a machine with moving parts – and the powerhub enables a huge variety of Best KitchenAid Mixer Attachments to be added with little effort. Deciding which KitchenAid Mixer Attachments to buy and use, and it get downright complicated. Yes, it’s kind of a plug-and-play sort of gadget in a major way, but it still requires some skills in order to take advantage of all the things that a KitchenAid stand-up mixer and its KitchenAid mixer attachments is capable of doing for you. If you want to maximize your skills, and take full advantage of all the different tasks your stand mixer and KitchenAid Mixer accessories can handle, then you may need some guidance on where to begin, what to try, and what to watch out for. In this article we are going to provide you with a list of twelve of the most common KitchenAid mixer attachments and/or accessories, what they do, which ones may or may not be useful to you, and what to be aware of for operating and for safety purposes. The KitchenAid Mixer When you buy the mixer, make sure you get one that has enough power to do the jobs you intend to do. There are home-models, and there are more professional/commercial models that aren’t necessarily larger in size, but they have motors that are more powerful for things like thick and heavy doughs. No matter what model number, color, or horsepower your KitchenAid mixing machine may be, it’s important to place it in a convenient spot on your counter. Make sure that it is plugged directly into an outlet (not an extension cord) and that you have easy access to it so that you can easily use it and clean it. A complete Comparison of KitchenAid Mixers is provided on this site for your use. The Spiralizer KitchenAid Mixer Attachment. This is one of the newest and trendiest of KitchenAid mixer attachments that you can use with your stand mixer. There are five different blades, and nine different cutting options that allow you to make apple strings or spiraled beets. The possibilities are limitless! But as with any KitchenAid mixer attachments that include cutting blades, be very careful, as the edges are extremely sharp and call for very attentive handling when using, or cleaning them. The 3-Piece KitchenAid Mixer Pasta Attachment – Roller and Cutter Set. KitchenAid mixer attachments like this one are truly among the “bells and whistles” of today’s stand-up mixers. The roller and cutter easily attaches to your mixer and does the work of expert pasta making without having to own a separate pasta machine, which means one less appliance to store, or have on your kitchen counter. If it’s pasta sheets you want for lasagna, or wide strips for fettuccine, or thin noodles for spaghetti, this is definitely the KitchenAid Mixer Pasta Attachment for you! The Slicer and Shredder KitchenAid Mixer Attachment. Again, having this Unique KitchenAid mixer attachment saves you from needing to purchase and store a food processor for your slicing and shredding needs. This KitchenAid Slicer Attachment consists of a small hopper where you insert your vegetable or cheese to be sliced or shredded. The Spiralizer Attachment comes with “cones” that allow you to vary the consistency of your slices or shreds. A very useful and best KitchenAid mixer attachment to have on hand, indeed. The Food Grinder KitchenAid Mixer Attachment. While the idea of this KitchenAid attachment is fantastic, as a way to grind your own meat, make grated bread crumbs, mash up some salsa, and so forth, this particular item has received very poor reviews. Unless you can find a newer version of this attachment that has resolved issues of metal particles in the food, or leaking motor grease, we would recommend that you do not purchase or use this attachment at this time. The KitchenAid Mixer Sausage Stuffer Attachment. If you do happen to find yourself with a well-reviewed and effective food/meat grinder attachment, you can then maximize that gizmo with this 3-piece sausage stuffer accessories it that works with the grinder. As a result, you can make your own sausage, with or without casings, and in the diameter of breakfast links, or kielbasa. Again, the reviews on this mixer attachment are not great…but perhaps in the near future the company will improve on this very useful aspect to what the KitchenAid stand-up mixer is designed to do. Let’s hope! The KitchenAid Mixer Beater Attachment. This is a standard KitchenAid stand mixer accessory that comes with almost any KitchenAid Stand up Mixer. It is meant to work heavier items such as cookie dough. This attachment is very useful, easy to use, and easy to clean. The most important factor, however, is to turn off your mixer when you are adding new ingredients or scraping the sides of the bowl. The power of rotation of the mixer, and the solidness of the beater blade, are so strong that you can cause great harm to yourself or your mixer if your hand, spatula or tool, gets caught in the blade while the mixer is running. So long as you are careful, and respect the power of the machine, you will be using this attachment all the time. The Wire Whip KitchenAid Mixer Attachment. This attachment is absolutely perfect for saving you the hard labor of fluffing up a batch of whipped cream, beating egg whites to a stiff froth, or mixing delicate batters. If you want a lot of air, then the higher the mixing speed you use, the more air will be incorporated. Or, if you are just looking for a thorough, but gentle blending of ingredients, then putting your mixer on low speed with this attachment is the perfect solution. Out of the many KitchenAid mixer attachments available, this one is pretty standard with all models of mixers. The Dough Hook KitchenAid Mixer Attachment. This standard attachment is by far one of our favorites as it takes the dread out of bread! Very little kneading is required with this device, and even if you have never made bread dough or pizza dough before, this Dough Beater Attachment is sure to make you feel like an all-star baker. As with the beater and the wire whip, this dough hook rotates around the mixing bowl in such a way that there is full coverage of all of the ingredients, within the bowl, that assure comprehensive mixing. It just doesn’t get much better than that! The dough hook tends to come standard with the set of KitchenAid mixer attachments included with your mixer – usually no need to buy it separately. The KitchenAid Pouring Shield Accessory. A pouring shield is a plastic or poly carbonate lid with an opening that is shaped somewhat like a donut. This is one of the best KitchenAid mixer attachments. It allows for the mixing attachment in the center of your mixing bowl to be able to rotate and do its job, it keeps whatever is being mixed from splattering outside the bowl and onto your freshly washed apron, and it allows you to safely pour further ingredients into the contents of the bowl while the mixer is still running. While we have sometimes found this accessory to be a bit cumbersome, it can be very helpful in terms of efficiency, and it can also help provide a level of safety that is particularly important if you are perhaps working with less experienced bakers such as your kids. The KitchenAid Bowl Lids. When you are baking, there are many times when a recipe will call for the batter or dough to either chill, or rest, or rise. When you can snap a perfectly fitting lid on the top of the mixing bowl, you can be confident that your chilling cookie dough, or your rising bread dough will remain free from air, and possible airborne debris or germs. Lids are always a great item to have, to save you some work from having to either transfer your dough or batter to yet another container, or from having to find saran wrap and have a not-so-tight covering for your mixed goods. The KitchenAid Precise Heat Mixing Bowl Accessory. As you likely know, depending on the model of KitchenAid stand-up mixer you own, there is always a stainless bowl as part of the package deal. The bowl sizes range from around 4.5 quarts to 6 quarts, depending on the model. However, the Precise Heat Mixing Bowl is an additional accessory that is pretty darn fantastic. It allows you to set a specific temperature so that you can temper chocolate, proof your bread dough, make yogurt or soups, and much more. Who knew that a stand-up mixer could essentially be all you need to make breakfast, dinner AND dessert?! All in all, a KitchenAid stand-up mixer is a real savior in terms of time and efficiency and labor. Because it is so incredibly versatile, you can accomplish all the tasks mentioned above, and many more, by having the mixer itself, and one or several of the available KitchenAid mixer attachments and accessories. There are many models available including the Artisan and Ultra Power Tilt-Head Models, the bowl lift models, the 7 quart Pro Line mixer, and the 8 quart commercial mixer. The most important thing for you to do is to truly determine what your needs and wants are out of the mixer you purchase. It’s a rather large expenditure for a kitchen appliance so you don’t want to go overboard, but you also want to make sure that all of your mixing and processing needs are met, for now and in the near future. Ask your friends what models they have, do your research, and be clear about what you’d like to accomplish with your mixer. If you just want to make angel food cake, and chocolate chip cookies, then you don’t need a top of the line model. But if you want to really dive in to making use of the impressive amount of features, attachments, and accessories that the KitchenAid stand-up mixer has to offer, then by all means…GO FOR IT! Gone are the days when you had just a handful of kitchen utensils which were enough for most cooking needs. With the increased intricacy and complexity in dishes with time, kitchen utensils are also going through a similar transition, and electric hand mixer attachments and stand mixers attachments are no different. While a lot of people may just skip further down this post to the best Kitchenaid mixer attachments, I encourage you to read everything! Note that KitchenAid mixer attachments seem to get all the press, but other manufacturers also offer comparable sets of both mixer head and PowerHub type sets of attachments as well. If you’re in the midst of a crisis and don’t know which is the best kitchenAid mixer attachment to use, take a deep breath and calm down we are here to save you. The topic of our discussion, yes you guessed it right is various kinds of KitchenAid mixer attachments and their uses. On a very serious note, with the kind of variety available today in kitchen utensils, mixer attachments by themselves can make a choice very daunting, especially if you do not have the right information. So if you want to buy yourself an electric hand mixer or have already bought one and don’t know what to do with the countless attachments that come with it, we are here to wipe that “got punched in the stomach” look off your face. kitchenAid mixer attachments dough hook and bladeHere is a list of top 10 mixer attachments that you must know how and when to use. So fasten your seatbelts as I take you on a tour to the world of electric hand mixer attachments. Over kneading bread, under kneading or getting it just right, if you’re one who does not know the difference between them or simply hate kneading dough because of the time it takes then this one’s for you. This mixer attachment that will most likely be in the shape of a “C” or in other cases a spiral will knead that stiff dough for you. Its design is such that it allows air into the dough while kneading which gives rise to a beautiful texture once baked. This one is one of the most commonly known and used electric mixer attachments. It consists of a balloon shaped structure and is made of eight or more flexible wires. These are easily available in a variety of sizes to suit different needs. It is best for whisking egg whites or cream to get that fluffy texture you desire for while watching your favorite cooking show on television. When buying a cheaper stand mixer this will be your workhorse attachment. This is a must have and comes with most mixers when you purchase them. This is an all purpose tool which will fulfill most of your baking and mixing needs. This attachment can be used at various speeds and is recommended for heavier mixtures or when the mixture is large in volume. If you want to whip something till its double in size KitchenAid K45WW Wire Whip for Tilt-Head Stand Mixer helps you, it will increase the volume of your mixture be it egg whites, cream or any other while saving a lot of you precious time. The paddle attachment is a multitasker and can help with a variety of dishes from mixing together the sugar and butter for those delicious chocolate chip cookies to shredding chicken for those club sandwiches, it can do it all. A scraper paddle however levels up the game by providing you with the satisfaction that the paddle attachment alone does not. I’m sure I’m not the only one who gets irritated at the sight of batter sticking to the sides of the bowl and the mixer ignoring it as if it doesn’t exist. The scraper paddle attachment for your mixer will scrape the sides of the bowl to make sure you don’t have to go through such discomfort ever again. Enough of mixing for now, now let’s talk about some of my favorite electric mixer attachments. These ones will want even the laziest of you to get into the kitchen for a bit of experimenting. A pasta roller attachment for your plain old electric mixture, how amazing is that? If you are a pasta lover you would know that there is nothing like fresh homemade pasta if you get it right. Might take you a few tries to get the hang of it but it’s definitely worth your time. And once you get it right, believe me you will never want to get pasta from the grocery store. A drawback however is that not many companies make this amazing utensil as an attachment to your mixer so you might have to invest some time to look for it. Some stand mixers offer a slicer/shredder attachment to make life easier for lazy people like me. This will make shredding a matter of seconds, be it cheese, potatoes, cabbage or anything else this one can take care of it all. A handful of companies make these but a KitchenAid mixer will surely provide you with this option, and the best part is that cleaning it up is much easier than cleaning up your food processor. Yes you read that right; we’ve got the perfect ice-cream mixer attachment for all you ice-cream lovers out there. While you must be thinking what the link between a mixer attachment and ice-cream could be, let me break the news to you, they have one for making homemade ice cream as well. No we’re not messing with you, this is as crazy as it can get. You can now make your favorite flavors in your own kitchen without the need of rock salt or other special ingredients. This especially perfect for all of you out there who love experimenting with new flavors and for those who have lost of children at home who love helping out in the kitchen. One thing that you must keep in mind while buying one of these oh-so-amazing KitchenAid mixer attachments for your electric mixer is that it should be the right fit for your mixer model. Some of these may be a bit pricey and so you don’t want them to go to waste. Once you have the right mixer attachment for the right purpose with you, your life in the kitchen is way easier than before.